Arizona Landlord Tenant Blog: What should a tenant look for in a new lease in today's market? What should a tenant look for in a new lease in today's market? A tenant should look for language in the lease that makes it a breach of contract for the landlord to let the rental property go into foreclosure. If there is a provision in the lease that makes it a breach of contract for the landlord to allow the rental property to go into any type of foreclosure, then the tenant has some recourse. 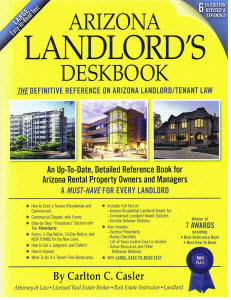 Specifically, if a trustee's sale is commenced on the rental property, then the landlord is in breach and the tenant should then follow the procedure in the Arizona Residential Landlord and Tenant Act (link to download copy is in the right margin of this Blog), send the landlord the proper notice and then vacate if the landlord does not cure the default. The AAR (which stands for Arizona Association of Realtors) February 2008 rental agreement form, is a nine page form; on line 206, it says, "Landlord shall not allow the Premises to become the subject of a trustee's sale." If the tenant’s language has this language, then the landlord is in breach of contract if a trustee’s sale is initiated. Depending on the facts, the tenant may be able to sue the landlord for damages, which may include moving expenses. Tenants should keep in mind, however, that not all lease forms include the foregoing language and that even the AAR 02/2008 form is not all encompassing. For example, a lender could commence a judicial foreclosure of a mortgage, or the lender (beneficiary) under a deed of trust could elect to foreclose a deed of trust as a mortgage, or a vendor in an agreement for sale contract could commence a forfeiture; in all three of those cases, the rental property is not "the subject of a trustee's sale" and the landlord would probably not be found to be in breach of contract. Response by Carlton C. Casler. The short answer is don’t sign the lease; find another property. The Act expressly prohibits the landlord from including terms in the rental agreement that take away rights given to the tenant by the Act. (See ARS Sec. 33-1315(A)(1)). The Act requires the landlord to give two days advance notice before entering to inspect or show the property. (See ARS Section 33-1343(D) (Note: the statute says two days, not 48 hours, as many people believe, and the statute says “notice” not “written notice,” which causes some problems because some judges insist on a written notice but others do not). The landlord CANNOT lawfully include language in the lease that reduces that time period. As for the language that allows either party to change or terminate the terms of the lease by giving a thirty day notice, that converts the lease into a month-to-month rental agreement. It is possible (but not certain) that a judge would find that the lease is unconscionable because it states it is for one year, but then converts the one year lease into a month-to-month rental agreement with language on a subsequent page. Under the lease, as you have described it, the landlord could let you move in and then give you a thirty day notice doubling the rent, prohibiting pets, requiring renter’s insurance, and any number of additional terms. Your only remedy would be to move or take your chances in court. My recommendations would be to look elsewhere – there are lots of rentals available these days.